Montezuma strolls through the beautiful garden with balconies extending over it, supported by marble columns. There are ten pools, in which were kept all the species of water birds. Some of the pools contain salt water and others fresh water depending on the bird’s needs. Three hundred slaves tend these birds, feeding them worms and seeds or fish from the salt lake upon which the city is built. He walks through a large courtyard, paved in marble with a chessboard pattern, where large cages, each covered with a roof of tiles, contain birds of prey, from the kestrel to the eagle. The Emperor continues on into the palace where on the immense ground floor are larger cages made of heavy timbers. In these are kept lions, tigers, wolves, foxes, and every variety of large cat. Montezuma amuses himself briefly with one of the mountain lions before moving on to the grand dining hall where six hundred nobles and merchants await—as they do each and every day. The meal is served by four hundred youths, who bring an infinite variety of dishes—every kind of meat, game, fish, fruits, and vegetables that the country can produce. At the beginning and end of each course the servants bring water for the hands, along with cotton napkins never used twice. When the Emperor finishes his meal he retires to his chambers to change into his second of four outfits for the day, each entirely new, never to be worn again. He is bored that day, having no emergencies to which to attend, so he decides to indulge in one of his few vices. Craftsmen and merchants bring their wares for his perusal. Montezuma studies the art and jewelry arrayed before him by the best craftsmen in the capital. The Aztec artisans are no part-time amateurs. They dedicate their lives to their craft. In a world permeated with religion and symbolism, they have no shortage of work to do. Jewelers sell most pieces in the marketplace, where a huge variety of colorful items are available, but the best are always reserved for the Emperor and other nobility. If someone important chose their work it would of course enhance their reputation. One common form of Aztec jewelry is the large ear plugs, which were really designed to fit into the ear lobes, and are popular with both men and women. Men also often wear ornaments in their noses through a hole in the nasal septum and also jewelry suspended from a slit in their lower lip. Aztec art is generally owned by the upper classes, and jewelry was no exception. 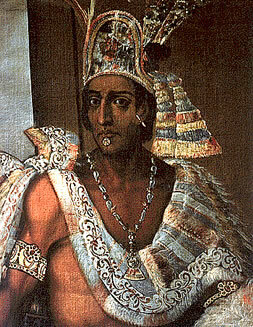 It is very common for Montezuma to wear extravagant necklaces and earrings. Aztec jewelry is made with a rich variety of materials, and often more than one type of material went into one piece. Mosaics are sometimes created by placing bits of various precious stones like jade, quartz amethyst, opal, and turquoise into a background of clay or wood. These stones are also highly polished and used in jewelry and ornaments. Other commonly used materials are shells, clay, wood, rock such as obsidian, and feathers. Copper, silver, and gold metals also find their way into jewelry. Copper is cold-hammered and carefully hammered into sheets or other forms. It is also cast into bells and ornaments through the lost wax process. The desired shape is modeled in clay, over which is dusted finely ground charcoal, followed by an even layer of wax. This coating is also dusted with charcoal and the whole enclosed in clay, which is perforated at the top and bottom. The molten metal is poured in at the upper hole after the wax is melted and the lower orifice plugged. When the metal cooled the cast is broken and the finished object removed. Silver and gold is very popular due to its relative abundance in the area and serves mostly as trim and adornment. While gold is used it is in fact considered less valuable than jade or even cocoa beans. It found a place in jewelry primarily because it is an easy soft metal to work into the artisan’s creations. The Emperor chooses a few pieces and one of his attendants pays the craftsmen a few pebbles of jade. Montezuma is pleased and relaxed and retires to his private chambers to pray and then get a good night’s sleep. But it is not to be. Barely an hour after he closes his eyes, two of his priest-advisors awaken him excitedly. “My Lord, my Lord, look outside!” One practically yells. In the sky Montezuma sees a comet with three heads and sparks shooting from its tail flying in the eastward sky. The vision sends chills down his back. It will just be the first of many such events. The next year, another comet, a pyramidal light, scattering sparks on all sides, rose at midnight from the eastern horizon and fades at dawn. This phenomenon appears for 40 nights, and is interpreted by the priests as the Feathered Serpent conveying a great message that presages war and mortality among the lords. Then the following year yet another comet is sighted. It is like a rip in the sky which bleeds celestial influences onto the Aztec world. While the Emperor watches horrified, a lightning bolt strikes the temple of Hummingbird Wizard and destroys it. Montezuma knows the prophecy is coming true, the year of One Reed is upon them. This entry was posted in Aztecs, Uncategorized and tagged aztecs, cortes, la malinche, malinalli, malintzan, Montezuma. Bookmark the permalink.